Mi się zajebiście podoba... Zwłaszcza areny (powrót dżungli?) Tylko po chuj te płonące łapy ? "Nawet jeśli wszyscy już w Ciebie zwątpili pokaż, że sie mylili"
Mógłby ktoś podesłać rendery postaci z TK6 w high res.? A ze niby juz sie ukazały? Known as martial arts genius, with his toned body and handsome face he was very popular. However when he was unable to beat opponents who were larger than he was, Bob became determined to engineer his body to increase power and weight while maintaining speed. 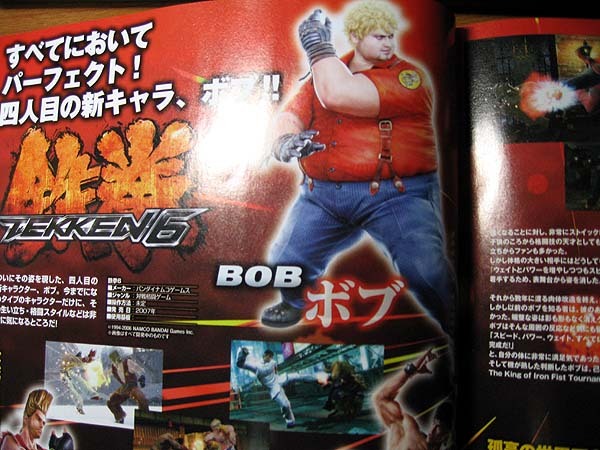 For this reason, Bob disappears from the fighting world. A few years later after completing his body engineering… Everyone around him is shocked at his appearance! Although people are not taking Bob seriously anymore, he is confident about his new found strength. To test his new found power he enters The King of Iron Fist Tournament 6.